It was Saturday night on September 11th, a somber date in American history to say the least. So it was most appropriate that before the Crighton Theatre curtain rose on Ira Levin’s hilarious comedy, “No Time for Sergeants,” director, Carolyn Corsano Wong, came on stage to welcome the audience, and asked that everyone first rise for a moment of silence in memory of the lives lost on that unforgettably tragic day. It was also very appropriate that in this time of continuing war abroad, the Stage Right players have decided that every performance of this new production will offer free admission to service veterans and their spouses. But perhaps the best thing being offered would be hilarity plain and simple. This may very well be the best comedy performance I have ever seen in the great state of Texas! It has often been said that in the theatre, comedy is the most challenging form for an actor to tackle. This able cast, with skillful direction from Wong, was certainly up to the task. And no one in the cast was more responsible for this success than Katt Gilcrease with his brilliantly flawless comic portrayal of Will Stockdale, a country good ole boy who is very proud he can read from the child’s book, “Tony’s Pony,” and suddenly finds himself drafted into the Air Force. Scott Thornton has great fun as the Draft Man who drags Stockdale out of the backwoods to serve, and Tom Lockhart, Jr. is a hoot keeping Stockdale in custody on the way to boot camp, while also reminding me of comedian, Jonathan Winters. The Stockdale role made Andy Griffith a star on stage and screen, but his performance was no more skillful and endearing than that of Mr. Gilcrease, who succeeded on countless levels. To quote Mr. Shakespeare, “…let me count the ways.” To begin with, Gilcrease had evident mastery of the enormous amount of dialogue required in this starring role. Add to that his easy delivery of the sweet southern twang that convinces us this is really a boy from the Georgia Deep South. On top of that, his appealing portrayal of Stockdale captures the innocence of a lad who finds it very hard to think anything but the best about everyone he meets. 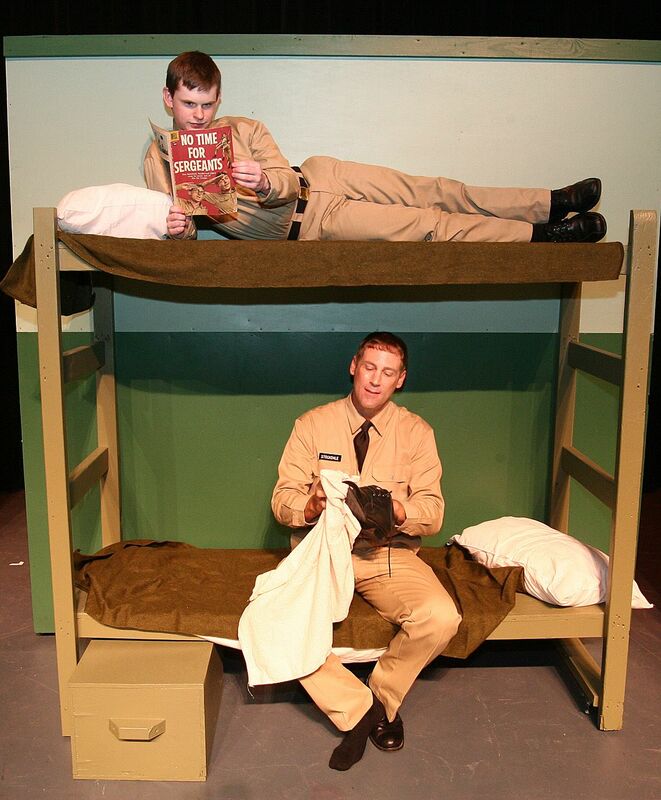 That trait makes for some very amusing situations at boot camp, and with perfect comic timing from Gilcrease, this hilarious production is well-anchored from the beginning. A wonderful supporting cast is headed up by the deliciously funny performance of Mackenzie Goode as Stockdale’s bunkmate and buddy, Ben. (Mr. Goode reminded me of the late actor, Brandon de Wilde, whom many might recall from his role as young Joey in the film classic, “Shane.”) Ben has no desire to be in the Air Force and dreams of following in family footsteps by being transferred to the infantry. Mr. Goode is a riot as he reaches his wits end trying for that transfer. 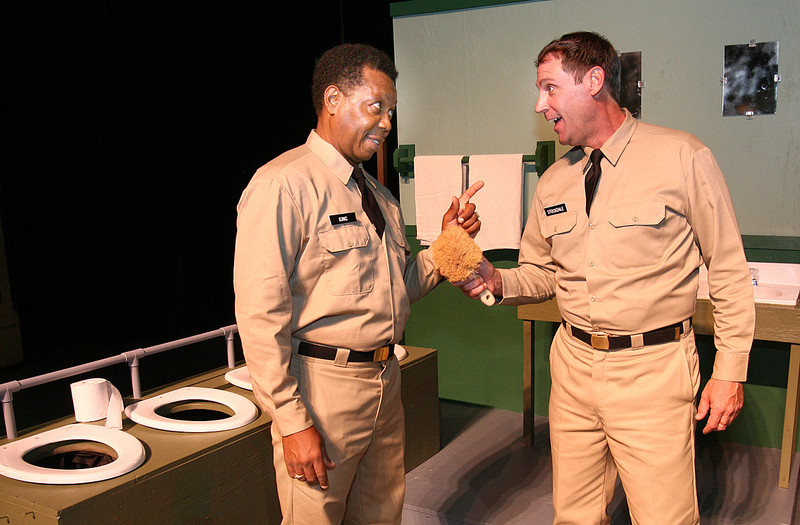 The two pals make life exasperating for their commanding officer, Sergeant King (Sedric J. Willis), who has an amusing “Why me, Lord?” attitude about having the pair in his unit. Willis supplies plenty of laughs as a sergeant who wears fuzzy slippers, and is really running out of patience with goofy recruits. Michael Raabe is another scene-stealer as the military psychiatrist who flips out himself while trying to examine the clueless Stockdale. The laughs keep coming from the blustering military “brass,” well represented by Douglas Burns as the captain, Catherine Anderson as the very serious female lieutenant, Quint Bishop as General Bush, and Mike Goode as General Pollard. (Goode, by the way, had an amusing secondary role as Stockdale’s Pa in the backwoods cabin.) The numerous other supporting players round out the humor beautifully, and the authentic costume designs of Kathleen Zaritski have everyone looking military sharp. The production staging is noteworthy as well, with eye-catching and highly mobile sets (scenic designers, Greg Kelly and Mr. Gilcrease) depicting attractive street scenes, the military barracks and offices, and a fabulous airplane interior for an airborne scene. The latter, mounted high above the stage, had exceptional lighting (designer, Roger Ormiston), and sound (designer, Ms. Wong, engineer Jim Tatum) that made the scene a highlight of Act Two. And would you believe a parachute drop right on the stage of the Crighton? Go see for yourself. Technical Director, Jim Bingham must have worked overtime on this production. For all the second act’s technical polish, the frenzied pace of noisy flights over atomic testing sites, bellowing generals, and airplane crashes tended to overwhelm the comedy and dialogue. So for pure comedy, Act One wins the day, but the whole package is a clear winner for Stage Right Productions. 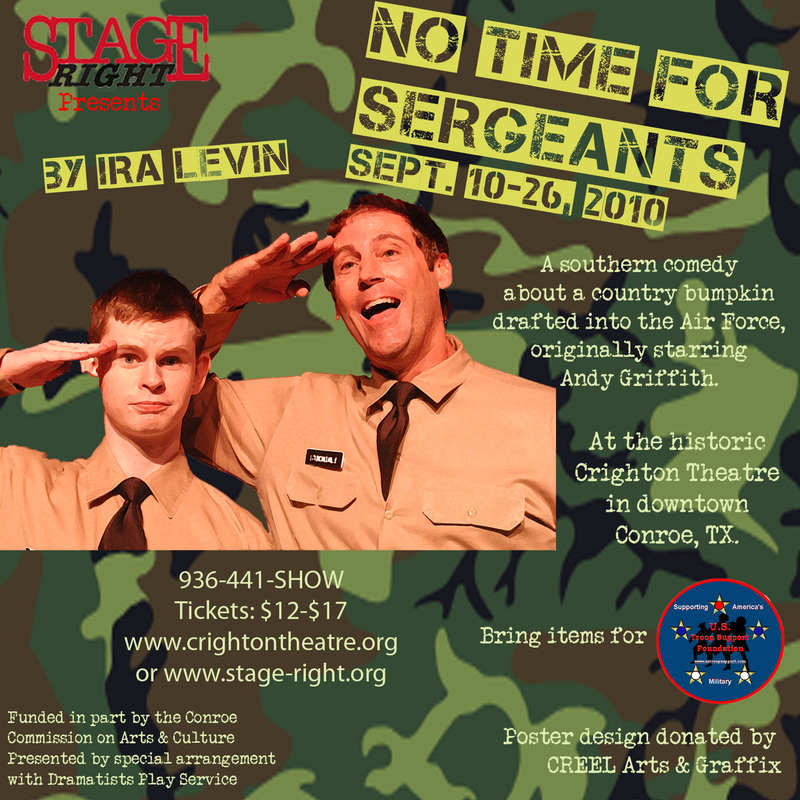 No Time for Sergeants continues at Conroe’s beautiful Crighton Theatre with performances Friday and Saturday nights at 8 p.m. through September 25th. There will also Sunday matinees at 2 p.m. on Sept. 19th and Sept. 26th. For tickets and information call 936-441-7469 or visit the website at http://www.stage-right.org/.